You are here: Home / Lifestyle / What’s In Our Beer Fridge? Many of you requested to see what’s in the beer fridge, so here is a peek inside from Matt! As mentioned, our wine purchases aren’t made with the intention of lengthy aging, but we take a different approach with beer. While I’m always going to have a few 12oz bottles of easy drinking stuff in the 5-7% alcohol range, I also have some stronger beers hanging in the back. 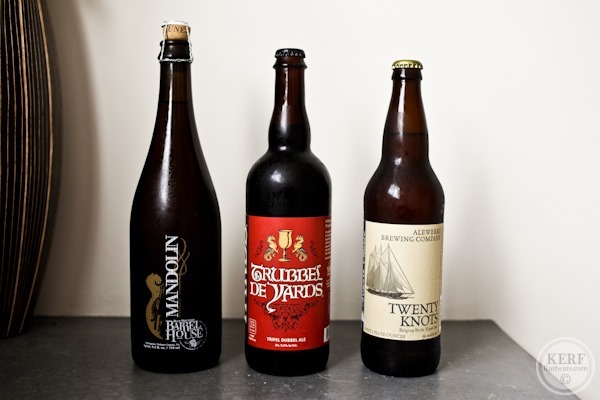 These beers aren’t purchased specifically for aging, but they’re special enough that it usually takes 6-12 months to find the right occasion to drink them. Usually I’m just waiting for the right person to come visit, so come on over! First let’s check out the hoppy stuff. Lagunitas is my favorite brewery, and I usually have one of their beers in the fridge at all times. I love their attitude, labels, and most of all the hop-forward beers. Little Sumpin’ Sumpin’ is probably my favorite, but I went back to an old classic when I bought this IPA. You could certainly lump me in the hophead category of beer lovers so I’m likely to always have a double IPA on hand. Stone’s Ruin Ten is fantastic. Hop flavor and bitterness age out of beer very quickly so don’t keep these around too long! 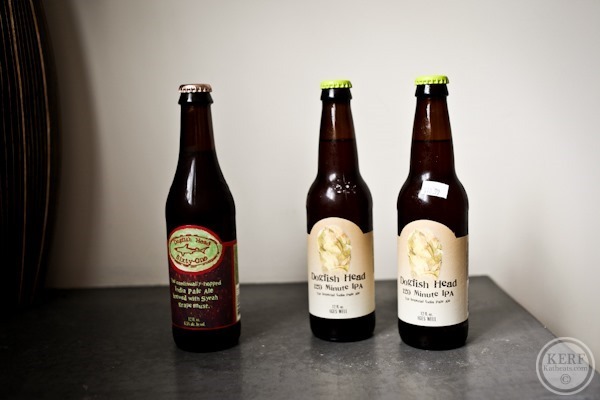 The Dogfish 61 is a really unique beer, which shouldn’t be a surprise from this brewery. It’s an IPA that is also fermented with Syrah grape must (“must” is the name for unfermented grape juice). So much of the wine character comes through – there’s this sophisticated fruitiness that you rarely experience in beer. To enjoy this one you’ll still need to be able to appreciate a bitter beer. On the right is the coveted 120 Minute IPA – I guess you’d say it’s a Double IPA but at 18% ABV and a note that says “Ages Well” you might think of it as a barleywine instead. When young this is insanely hoppy and bitter, with a nice sweetness from the malt and alcohol. As I mentioned above, the hops and bitterness will fall out over time, though I’ve had a 2.5 year-old one of these and it was still intense. I bought these at some point in 2012 and I’m not sure when I’ll want to drink them. Now we’re getting into the higher ABV beers, but the ones you see above are actually intended to be pretty refreshing. They’re all Belgian-inspired, and if Belgian beer is one thing, it is intended to be drinkable. Belgian food can be fairly heavy so the beers are made to balance the palate. Mandolin is from our favorite local brewery, Blue Mountain. I feel like most high-alcohol beers have the stigma that they should be consumed only in cold weather, but this beer still manages to be drinkable at 9% ABV because it manages to be fruity and rich with a dry finish. That dryness on the palate is what makes you feel like you’re not eating your thick, rich, filling beer. I picked up the Trubbel de Yards directly from Yards Brewing Co when I visited Philadelphia for the National Homebrewers’ Conference. I haven’t had it yet so I’m excited to try it! The name indicates the beer is supposed to blend the fruitiness of a Dubbel with the piquant spiciness of a Tripel. We got the Alewerks Twenty Knots on our Williamsburg trip – no idea what it tastes like but I’ve been so impressed by every one of their beers that I have high expectations. 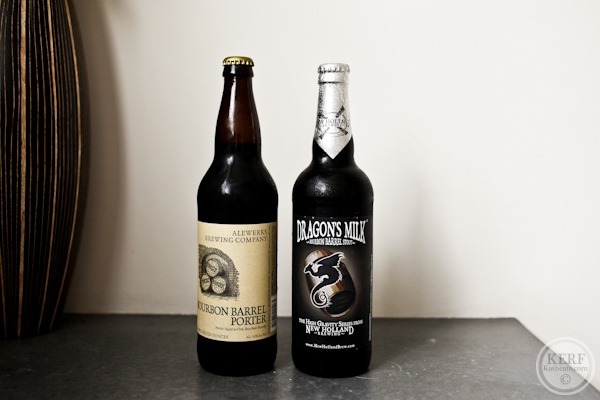 Dragon’s Milk is one of my Top 10 beers (and Kath’s too according to this post). Rich, dark, and oaky. You must buy this beer! Speaking of bourbon, Isaac and Brittany gave us these exciting beers from a newer brewery in Richmond, and we’re looking forward to the winter. In the case of the Bourbon Cru I’m excited to see more breweries doing unique stuff with Belgian and Abbey styles (it’s a Quad aged in barrels). I first had this beer from Epic on a whim a couple years ago while shopping at Beer Run. I was so blown away that I’ve been searching for it ever since. Two years later I saw a bunch of bottles on the shelf so I picked up several. It’s such a complex beer because it has fruity and spicy notes from the Belgian yeast, plus a rich bacony-smoke, and some vanilla and body from the oak. Turns out that Epic has made multiple batches of this over time and each one can be quite different. One of these is 10.6% ABV and one is 12.5%! You know we’re fans of the barleywines – I love how much a bottle can change over time, going from what sort of amounts to a Imperial Amber Ale loaded with hops and bitterness to a smooth and warming beer with flavors of toffee and treacle. I used to collect Sierra Nevada’s Bigfoot barleywine from each year and do vertical tastings (see this post for an epic one!) and I got out of the habit. So I’m starting again with 2013. It’s a classic American barleywine. I also picked up this special version that I believe is the 2012 version that Sierra Nevada aged in oak themselves and then released in this packaging. Can’t wait to try it! Here are a few unique beers. We had the 2013 Stone Old Guardian barleywine a few months back, but I’ve been saving this smoked version since then. I love smoked beers, and I think a barleywine is a great style to do it. The can is from 21st Amendment and it’s an English-style barleywine which means it’s a little more floral in its hopping and goes even heavier on the dark caramel flavors. How bout that for an energy drink!? Freudian Slip was a gift from Larbs – thanks sis! Anybody into sour beers? Certainly they’re an acquired taste. If you’re primarily a wine drinker who doesn’t like beers, give sour beers a try. Similarly to wine, they’re very dry and have subtle and sophisticated fruity flavors. Typically these are normally fermented beers that then have other special yeasts and bacteria introduced to further ferment the leftover sugars. Some come across as bad vinegar, but some have a pleasing tang that complements the fruity malts. 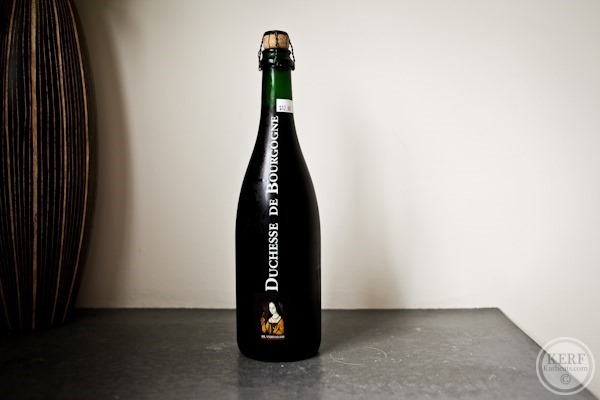 The Duchesse is a good starter sour beer! And finally, you know we have a few of these around – in fact, we still have half a case of Pumking still left from when we bought it last year! I guess we’ll have to do a vertical tasting at some point? Kath approves. What is your all-time favorite beer? You are the beer master! 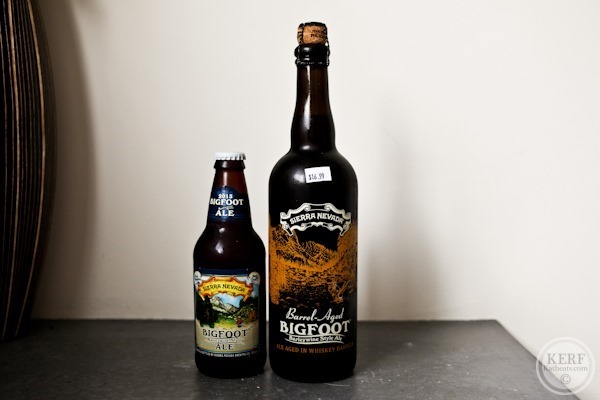 Ahhh, I do love the barrel aged Bigfoot! My favorite beer (today, at least) is the Eclipse stout aged in an 18 year Elijah Craig barrel. I did a vertical with three years of those and almost died of happiness! I remember that Sierra Barleywine tasting! I want to go back on that beach trip! This makes me miss American craft brews so much! We moved to Germany last year, leaving the Pac NW and an abundance of delicious beer. My favorite is Mac & Jack’s African Amber. I’m not a big fan of German beer, but I’ve found a few that I like. And we are close to Belgium, and they make great beer. I do miss a good porter, but there are some darker beers here that are decent. Mostly I miss the variety of choices available even at the grocery stores. Here it’s pils or hefe. Oh, and I finally had a Pumking (on draft!) in Savannah last fall. It was everything I hoped it would be. Nice collection! 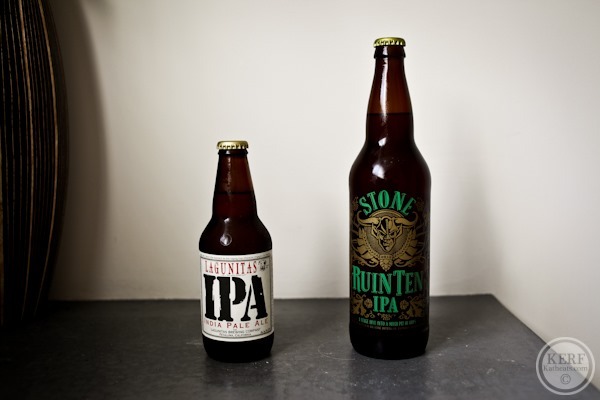 My all time favorite beer is Stone IPA, but I also love anything Lagunitas brews. I may be bias though since it’s so close to home for me. I live in Sonoma county and we love lagunitas too! One of my favorite beers is Perdition from Russian River BC. Also damnation, although it’s changed over the years. And Brother Thelonius from North Coast BC. I could go on…! I love beer! That sounds weird to say, but its true. One of my favorite activities to do with my husband while traveling is going to local breweries and sampling new brew. But my all time favorite beer is easy to pick out, it is St. Lupulins an extra pale ale, out of Odell Brewing in Ft. Collins, CO. It is their summer seasonal, and oh so good! 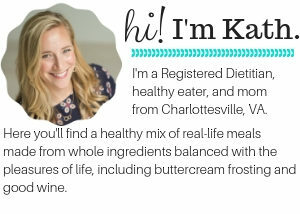 It’s not weird Kate, it’s fabulous! Since I’ve moved back to my northern California hometown for work, my dad has become my beer tasting buddy! 🙂 Whenever either of us travel, breweries are sought out, and beer is always brought back to share. He has converted a large (haha, I almost typed lager) portion of his garage into a cellar-type storage area. We drive my Mum nuts! They took a trip to Pennsylvania a few weeks ago, and he texted me a picture that I expected to be of family. Nope! It was of a uniquely designed growler from a new brewery that he had found. We too love beer and barleywines! My husband could take or leave beer except for an occasional pint of Lost Coast Brewery’s 8 Ball, which is a very smooth oatmeal stout, even then only when we visit Eureka and he can have it on draft. As for me, I may very well have to second Brother Thelonius from North Coast Brewery that Melanie mentioned, or their Old Stock Ale. Has anyone had the barrel aged Narwhal Imperial Stout from Sierra Nevada? Yum! I’m getting a little carried away here. I usually have a beer once or twice a week, but one certainly wouldn’t think that from how excited I get about it! On to reading more comments! So jealous of this collection! My favorite standby is Ranger IPA by New Belgium Brewery. Favorite pumpkin ale is the Cottonwood Pumpkin Ale by Foothills, and my once-a-year bear that I treat myself to is the Vanilla Bean Porter by Breckenridge Brewery. It’s so perfectly amazing, but I never want to burn out on it so I usually only drink it on my birthday. 🙂 Cheers! Lagunitas Maximus is my go-to. I can’t get enough of it! Great post! I agree that Lagunitas is mind-blowingly good. I also recently had an IPA in California from Deschutes (in Bend, OR) called “Fresh Squeezed.” Evidently they fresh squeeze the hops for it, hence the name. Well, it was probably the best IPA I’ve ever had. Why are west coast IPAs just so much better? A note about Pumpking: I bought a couple bottles this year, and I don’t think the flavor is the same AT ALL. It didn’t have the buttery, smooth finish I expect of Pumpking. It was way overspiced, an issue I encounter with lots of pumpkin beers. I was disappointed. We have another bottle in the fridge that I’m not even excited to crack. I’m looking for some Shipyard Smashed Pumpkin to fill the strong-smooth-buttery-pumpkiny-sized hole in my heart. I totally agree about the Pumpking tasting different this year…I was so sad because it used to be one of my favorite pumpkin beers! The Epic brewey is basically in my backyard! I live in Salt Lake City and this brewery has been a god-send. I haven’t found a beer of theirs that I don’t love. Thank you so much for this post Matt! I was just searching earlier this morning for Kath’s last beer post, specifically for pumpkin flavored beer. I’ll be keeping my eye out for Pumpking. Thanks again!! Lagunitas is opening a brewery here in Chicago! Woo!! They are actual a sponsor of my running club and created a new beer called Runners High-PA. It’ll be on the market soon, so keep your eyes out for it. Thanks for sharing! These types of posts are always so informational and have me wanting to try all sorts of new beers! Pumking is high on my list of favorites as well as Bluegrass Bourbon Barrel Stout. Have you or Matt ever been able to get your hands on Heady Topper by Alchemist Brewery? It’s from VT, so it’s nearly impossible to get in other parts of the country, but it’s, by far, the best IPA I’ve ever had in my life! If you guys ever find yourselves in VT, definitely head to The Alchemist! Late with my reply, but had to second this! All other beer is ruined for me after having Heady Topper. I just wish I lived closer to Waterbury! I’d rather have a glass of wine…or 2! My hubby likes craft beers. He’s really into the Pumpkin seasonal beers. But a year-round favorite is Magic Hat Elder Betty! I really love that crème brûlée stout, but one of my other favorites is Hop City’s Barking Squirrel lager! The past almost four years I’ve been pregnant or breastfeeding so I haven’t been able to really drink whole beers much but my husband, like you, is quite the connoisseur and so I’m able to taste plenty. I am looking forward to the day, maybe in eight months or so, when I can drink A Little Sumpin’ Sumpin’ (or Sumpin’ Sumpin’ Wild? hehe) from start to finish…and then another. I don’t know if you get any Boulevard out there but one of our fav seasonals is their Bourbon Barrel Quad which is brewed with cherries and almost has some sour notes. It’s super hard to find after the release day though, similar to their other very popular seasonal Love Child (#1, #2, #3…). Those may be my fav special occasion beers. As for run of the mill hot summer days you’ll find me drinking either Lagunitas IPA or Sierra Nevada Pale Ale. I also love Boulevard Tank 7 which is a saison. Definitely love saisons. Anyway, I could go on. Also, you have great taste in beer.Cheers! What about a non-bourbon stout? My personal favorite is Founder’s Breakfast Stout. What other kinds of porters or stouts do you like? Oh and have you tried Sweet Baby Jesus? I think it’s weird but fun. Chocolate peanut butter beer?? That’s interesting stuff. I love beer(and every other kind of booze). Very cool to read this post! My husband is a homebrewer and we just got back from a trip to California. In addition to visiting the wineries, we stopped at Russian River, Lagunitas, and Bear Republic. We shared tastings at all of the breweries – I tend to like a classic IPA like Pliny the Elder or Lagunitas IPA, but also really enjoy the sour beers! I’m a big fan of Central Waters Ouisconsing, but I’m really intrigued by those smoked beers! That creme brulee also looks amazing. I discovered a banana bread beer this summer and, while I don’t usually like “fruity” tasting beers, it is amazing. My favorite beer is Hoegaarden!!! Love the coriander in it. My husband would be so jealous of your beer fridge! I am not a beer expert by any means and I have to admit, I LOVE a Corona with lime in the summer. However, I am loving Shocktop a lot lately and I recently had their raspberry…DELICIOUS! Looking forward to trying their fall brew this weekend while watching football! Yay beer! Some of my favorite go-to beers are Stone IPA, Lagunitas Dogtown Pale and Port City’s Monumental IPA. Love the hops! Now that the cooler weather is coming I’m looking forward to darker beers like Mendocino’s Oatmeal Stout, Bell’s Double Cream Stout, and Schlafly’s Irish Extra Stout. The only kind of beer I don’t really like are fruity or sweet beers. No pumpkin beers for this girl, though I did have a pumpkin stout I didn’t hate once. My fiance and I homebrew too and that is always fun getting to make and try new beers. So far they have all been delicious! What is your favorite type to brew? Looks good and all but I HATE beer…I think I’m the only Canadian who does, lol!! Hey Matt, have you tried the new Three Notch Brewery yet? We were in there the other night and they have some tasty brews. I can also report that McGrady’s has a number of pumpkin brews as well as octoberfests on tap right now. I prefer Lindeman’s fruit lambics (the raspberryis good – the peach is my favorite) and I love a Flemish sour. My husband has a work bench in the basement full of beers that are aging…and we always try to find liquor stores when we roadtrip in case we can find something he hasn’t tried yet. Raison D’etre from Dogfish Head which surprised me because the thought of raisins in a brew seemed odd to me. I still need to try their 61, which I’m sure will be great since I like bitter beers. 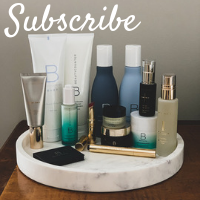 I really enjoy your blog, by the way! You haven’t had pumpkin beer till you’ve had Schlafly’s Pumpkin Ale. So, so, so good!!! If you can find it, give it a try. I’m in Evansville, IN and we typically only get one shipment a season and it sells out in a couple of weeks. My favorite beer of all time is Buzz Bentley.But I don’t know if it’s an amber or an IPA or a stout or whatever. Love the label, too! you are so knowledgeable about beer! i think the smoked oaked & pumking both look wonderful! My husband’s favorite beer is actually that Southern Tier Creme Brulee! I love that one but I’m more a fan of hops… Not sure I could even pick a favorite beer. We bought the Little Sumpin Sumpin Wild for our wedding and it was fabulous! I’m from Santa Rosa CA and love Lagunitas too. My dad is a homebrewer and I just sent him this blog so maybe he will comment too. 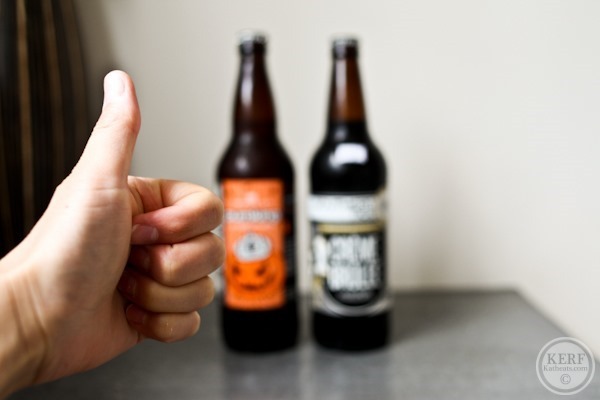 My current favorite beer is Cottonwood Pumpkin from Foothills Brewery in Winstom Salem… We had a microbrew party and that was voted the best beer from 20 people! Wow that’s a favorite of ours too! I think I mentioned this in a previous comment a while back, but if you ever make it to Denver, you MUST go to a Belgian Beer Café called the Cheeky Monk. They have the best food (including an amazing beer hummus and homemade beignets) and imported Belgian beer including Kwak. I don’t drink beer but I love hard cider! Though this fall my goal is to try pumpkin beer. Do you think something like Pumpking is closer to beer or cider? Green Flash West Coast IPA and Ballest Point Sculpin! I live in So Cal so.. the Bruery and Bootlegger’s Brewery are huge favorites- really any of their beers. Hopefully you can get them there! Goose Island Bourbon County Stout is one of the best beers I’ve ever had!!! They didn’t distribute it to the west coast last year, and I was so disappointed. It’s got delicious notes of caramel, smoke, chocolate, and toasted marshmallow (!!!) 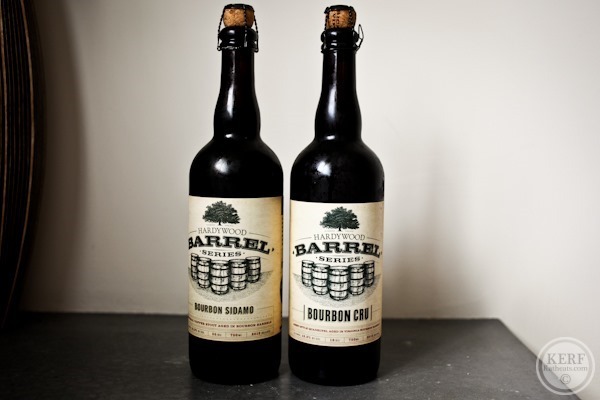 – http://www.gooseisland.com/pages/bourbon_county_stout/59.php I think you’d LOVE it!!! My husband and I are both huge beer drinkers too, although neither of us are big into hops. I avoid IPAs at all costs! 😉 Southern Tier’s Creme Brûlée is by far our favorite beer of all time. We have 2 hanging out in our beer fridge right now for the right occasion. 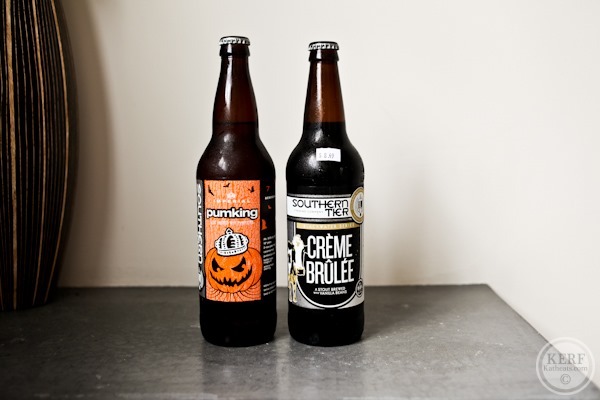 I love their Pumpking, but being loyal to my hometown O’Fallon and Schlafly are still my favorite pumpkin beers. I bought my hubs Dragon’s Milk per the last beer post and we both LOVED it! 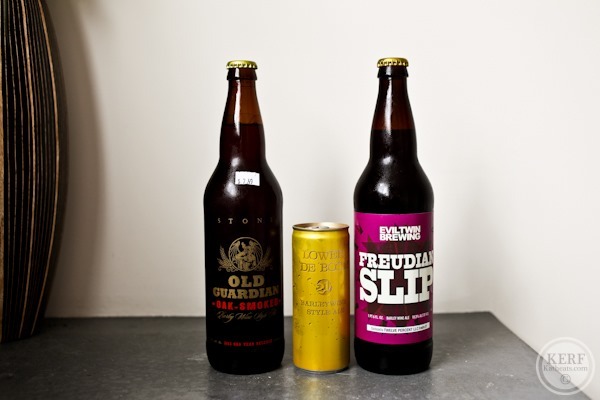 We always have at least a 6 pack of seasonal favorites, lighter/fruity beers (for me), and/or stouts in our fridge. Funny that Lagunitas is your favorite. My friend got a job with them as a quality control tester. That means he goes to bars and makes sure they are serving Lagunitas at the right temperature, etc. Rough life. Anyhow, what kind of beer distribution do you get in that part of Virginia? I’m surprised that you get such good West coast breweries. Here in Dallas we tend to get decent Colorado beer, California, and some east coast stuff. But nothing from the Midwest. To get San Diego beers is pretty impressive. I tend to stay local and affordable. I love 512 IPA, Jester King Wytchmaker, and my friend is a brewer at Independence and I love the Stash IPA. I’m getting to know sours right now and am a fan. Not usually a fan of light pilsner or heavy handed barrel aged. I’m Amy’s (who posted earlier about her current favorite beer, Cottonwood Pumpkin) Dad from Santa Rosa, Ca. Amy and her sister were “forced” to visit many breweries during family vacations, along with visiting the Oregon Brewers Fest in Portland one year, a classic annual event. I guess my girls’ current fondness for beer was due to this early (and often) exposure? Now that they are of drinking age, it is definitely more fun to visit the breweries with them. 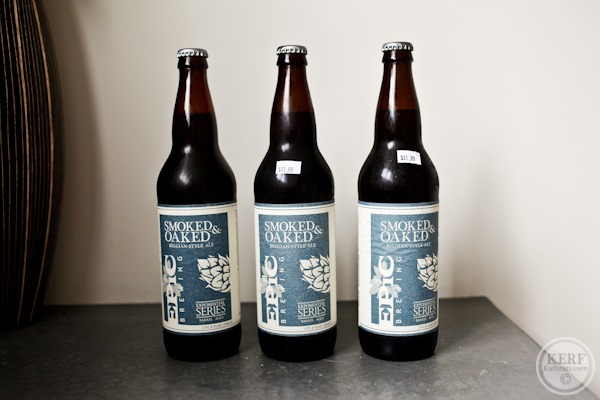 One of may favorite beers, for those of you who like smoked beers, is the Smoked Porter (22 oz) from Alaska Brewing Company. Get more than one bottle so you can lay it down, or drink it right away! Thanks for sharing! Would Matt ever consider sharing any of his beer recipes? Have you or Matt ever had Heady Topper from The Alchemist? I love beer too! I’ve been a huge hop fan for a long time now and I find that’s all I want to drink. My all time favorite beer is Bell’s Two Hearted but here in St. Louis, I have a bevy of excellent craft beer to pick from (Schlafly, Urban Chestnut, 4 Hands, Perennial, etc etc!). Great post!